Jimmy Martinello is an Arc’teryx ambassador who has been exploring the Coast Mountains for over 20 years and has been a Mountain Life contributor since day one. He combines his love of adventure and photography to capture bold imagery while actively participating in a vast array of outdoor mountain pursuits. What’s going on here and where is this? This is Jon Johnston ascending the north face of Mt. Hickson that rises off the Scimitar Glacier in the Waddington Range. Chris Christie is just below him. We spent two weeks base-camped on the glacier, but this was the most intriguing line because it rose 7,000 to 8,000 feet from the glacier to the summit. It was pretty intense, but it felt so awesome to be surrounded by a bunch of massive peaks with not a soul in sight – we didn’t see anyone for two weeks. A very inspiring place to be, that’s for sure. You have to tilt your head slightly to really appreciate the steepness here. 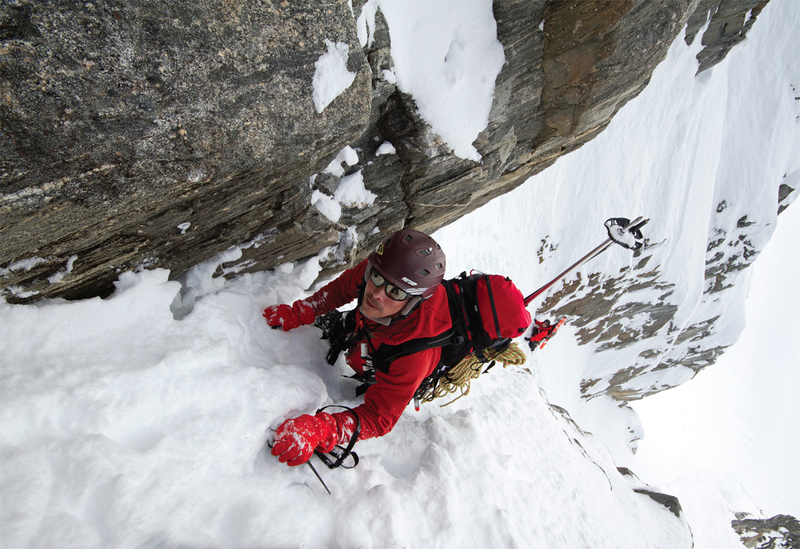 Were you scared at any point, being the first one up this couloir to get this vantage point? Yeah, it was definitely spicy! It was steep and we didn’t have a lot of gear for that couloir. We ascended this line but came to a rock wall section a little farther up, and as a result we had to downclimb, which was pretty wild. We ended up going to another 4,000-foot couloir and skiing it the same day. This was a really exciting place to be though, definitely challenging right in the shadows on this north-facing side. It was such a big place. Big exposure, big consequence. Is it hard to pull out the camera under these circumstances? Yeah, that’s the hardest part when you get into situations like this one. It’s so amazing to capture these photos, but it’s also kind of scary just being able to set yourself up safely, pull out the camera and compose something that does it justice. But when you do, it’s sure worth it. Teamwork is integral in ski mountaineering, especially in really remote zones like this. How do you prepare, mentally, to head out and stomp a boot pack into terrain no one has ever been in before? You gotta be with the right crew for sure. I wouldn’t go into a place like this without guys like Jon and Chris. We spent most of the winter skiing and climbing with each other, working our way into similar places as this. It’s taken a lifetime of skiing with solid people in the mountains and you want to be able to trust your life with them. If anything happens, you need to know you can count on each other to get out safely in any kind of situation. For you, what is the reward for being the first to ever climb or ski a new line or zone? Going first doesn’t really matter so much for me, I just love the mystery of the unknown. There are so many answers for everything now, and guidebooks and maps, that it’s nice to get out there and just do things for yourself with good friends and family. Figure it out your own way, that’s what I love.